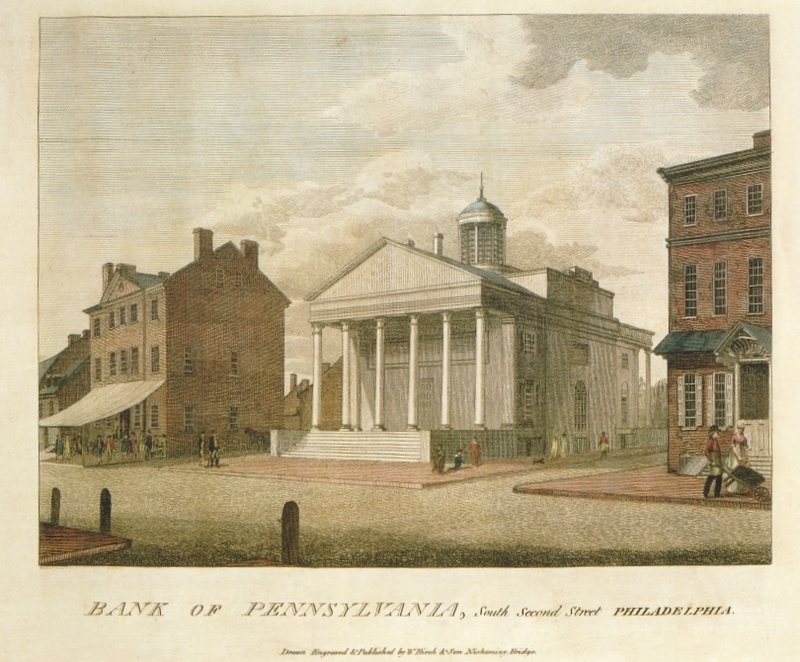 The Bank of Pennsylvania was still under construction in 1800 when Birch published this engraving. It was built 1798-1801 from Benjamin H. Latrobe's innovative designs that began the Greek Revival movement in American architecture. Faced with marble the Bank had simple Greek-Ionic porticoes on both the front and rear. The banking room was a rotunda forty-five feet across above which was a flat stone dome surmounted by a lantern. Noted architectural historian George B. Tatum wrote, "No other building is as central to an understanding of his (Latrobe's) career, and few are as significant for the history of American architecture." 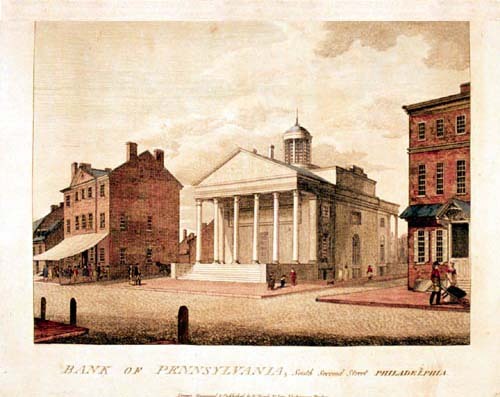 Created in 1780 to raise money for the 0Continental Army, the Bank had a special relationship with the Commonwealth of Pennsylvania, just as the First Bank of the United States (1791-1811) had with the federal government, which was to control currency and credit. In the world-wide financial panic of 1857 the Bank of Pennsylvania failed, exposing its gross mismanage ment. The building served as a federal prison during the Civil War and was demolished in 1867. City Tavern, just south of the Bank (MG-L,) was built by subscription in l773. Its board of directors represented the city's most socially, financially and politcally prominent individuals, among whom were the Cadwalader brothers, John Nesbitt, Dr. William Shippen, Jr, Robert Morris and Thomas Willing. During the last quarter of the 18th century the tavern was the scene of the foremost gatherings. The delegates of the First Continental Congress were feted there at the beginning and end of their sessions, and on many occasions Washington was feted there with banquets and balls. John Adams claimed it the most genteel tavern in all the colonies. Torn down in l854-55 it was faithfully reconstructed by the National Park Service in l975-76 for the Bicentennial celebration. 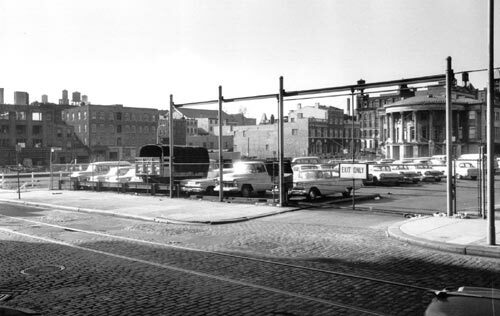 The building with the semi-circular colonnade (BG-R 1960 and 2000) is the Philadelphia (Merchants') Exchange built l832-34 from designs of William Strickland. In 1965 its cupola was reconstructed. The Exchange was the commercial center of the city for the balance of the 19th century. 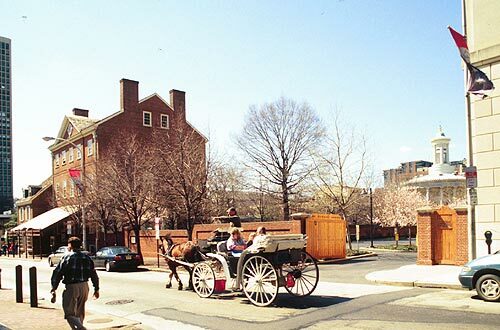 In the 2000 photograph (BG-L) is a corner of one of the three Society Hill Towers (see commentary, Plate 16), and in the (FG-C) a carriage similar to others that are available for sightseeing in the "Old City.." The driver is pointing to "Welcome Park," named for the ship that first brought William Penn to Philadelphia i n 1682, called the "Welcome." The park is located on the site of the "Slate Roof House", Penn's residence in Philadelphia 1699-1701.